HIGHLY RECOMMEND THIS HOME. Gorgeous tropical living with the tropical sun shining into a central courtyard was how we wanted to spend our first winter of retired life well away from a Canadian winter. 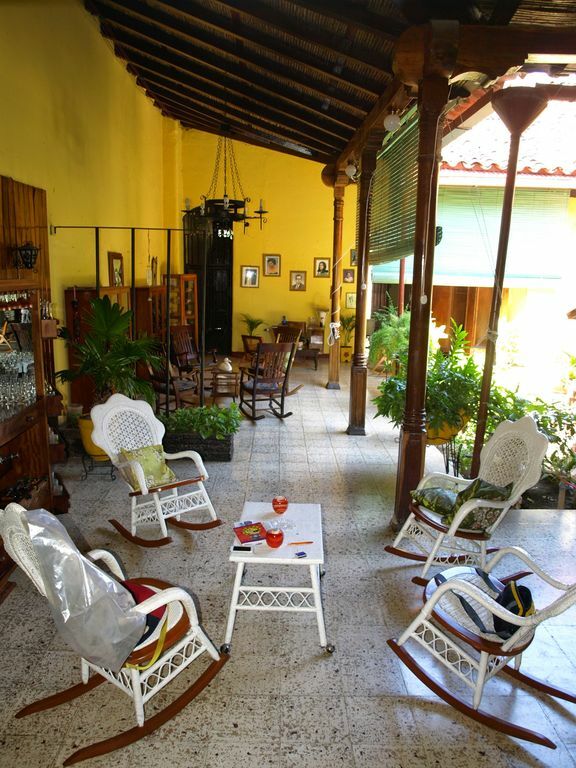 We chose to do that by living in this traditional Nicaraguan home for an extended period of time. We chose this house because it didn't sound too touristy and posh. It sounded like a real home in a nice area of town that was close to all the amenities. We were ecstatic with our choice. The home is exactly as described and pictured. While the house is on a main street which can be loud with traffic noise in the day, by 9PM or so this part of Granada becomes quiet presenting no difficulty in getting a good nights sleep. The Iglesias just down the street periodically rings bells for prayer very early in the morning, but again it's not disturbing. The kitchen and appliances worked very well and we ate in most nights. There are multiple grocery stores within a 20 minute walk, including one that has all sorts of imported foodstuffs. You must know that a traditional home is open to the sky in the middle and built for good airflow. This means that it can be noisy during the day and quite dusty. In the evening there can be lots of biting insects so protection is needed - easily purchased here. The master bedroom and ensuite is sealed and air conditioned, however, so it does not get too dusty or buggy. We didn't use the spare room but it is also sealed and air conditioned with an ensuite. By luck we had chance to meet the property owner, Juan, when we first arrived and he was very helpful in setting things up for us with his amazing housekeeper Rosie. With his help (no hablo Español) we arranged with Rosie for her to keep the place clean and dust free. She regularly changed the bed linens and towels and agreed to do our laundry. She also made arrangements for refills for the water cooler which meant we always had drinking water. Juan also helped us with what an appropriate remuneration would be for Rosie to provide these services. We can't speak highly enough of Rosie - she always made things look SO nice and was patient with our halting Spanish. Wifi and large screen TV worked great. Be prepared for occasional short term outages of the internet, however. Covered outdoor life surrounded by countless plants, sunshine pouring into the centerpiece courtyard's garden is the only way to experience Granada and Nicaragua. This old Colonial has both original concepts and modern updates. Master bedroom is roomy with full bath and A/C. Bedroom #2 is a tight fit with twin beds, private bathroom; perfect for a kid's room and also with A/C. Kitchen has large, new refrig and full size stove with griddle. Large kitchen has 2 sinks and spacious countertops and we cooked in every meal. WiFi worked great. Housekeeper Rosie couldn't be more pleasant and helpful. This home is a winner and family perfect! Sorry about the late response.... I have been involved in multiple projects at work since the beginning of the year and was not able to thank you for your kind comments. We were glad to have you as a guest. We reviewed your comments and have decided to remove one of the beds from the second bedroom thus making it roomier. We continue to make improvements wherever we can. We'll keep you posted in case you want to comeback next year.